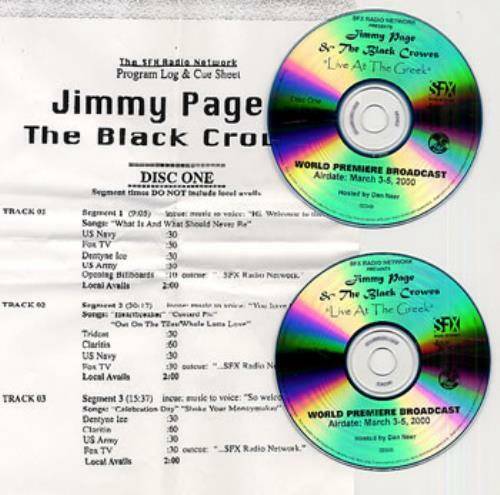 JIMMY PAGE & THE BLACK CROWES Live At The Greek - World Premiere Broadcast (Rare 2000 US SFX double CD-R acetate radio show, presented by Dan Neer with comments and observations by Jimmy Page, Chris Robinson and Rich Robinson. The show features 13 tracks from the 'Live At The Greek' album, including Heartbreaker, Shake Your Moneymaker and Oh Well, originally broadcast Match 2000, includes cue sheets). or visit our The Black Crowes image gallery.